Last monsoon, I sat holed up in the same room, gazing at the swaying palm trees through the large windows, trying to make sense of the words scattered in my mind and across my notebook. A jasmine-scented breeze wafted in to shake me out of my daydreams. As the pitter patter of rain filled my ears, I worked furiously to pen my words, my stories, my journey. 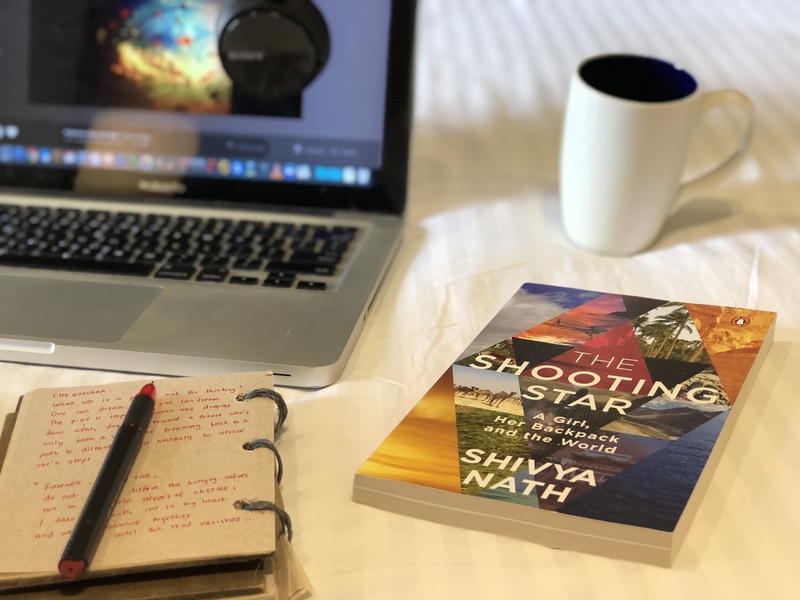 This monsoon, reliving my susegade digital nomad life in Goa, I am delighted (and in equal parts, nervous) to share that my first book – The Shooting Star – will be released soon! Published by Penguin India, my dream publishing house and one of India’s biggest, this long journey of writing and editing a book is finally reaching fruition after many years. Limited copies are now available for pre-order on Amazon and Flipkart! The book (named The Shooting Star after my blog), charts my journey from the cubicle to the road and from small town India to remote corners of the world, through a series of untold stories – some too bold, some too embarrassing, some too personal. I write candidly about my upbringing, relationships, battles, triumphs, adventures (some illegal) and life-changing. I wrote and re-wrote many drafts before the current version of the book. I gave up many times. But in February 2017, close to my 29th birthday, something changed. I knew it was time to commit. I had stories to tell, perspectives I needed to share. In cafes, homestays, even monasteries across Uttarakhand, Thailand, Slovenia, Georgia, Spiti and Goa, I wrote. And even though it was becoming such a big part of my life, I didn’t tell a soul about the book because I had no idea if it would really be published someday. But now that the book is out in the universe, I’m relieved. My secret’s out. This adventure is yours now, this journey is yours. The Shooting Star – Limited Copies Available Now! A million thanks to so many of you for pre-ordering the book! Amazon just ranked it a best seller in both travel writing and travel (non-fiction), and I’m so immensely grateful. A quote from The Shooting Star. Do you dream of writing a book someday? What would you like me to share about the book writing process? Connect with me on Instagram, Twitter and Facebook to follow my adventures, the journey of my first book and the book/travel events I plan to do across India in October 2018! Congratulations and looking forward to reading your book! Do you have plans for a Kindle version? Thanks Sivapriya! Yes, the kindle version should be available by mid to end September. Will share an update when it is. I have been following Shivya’s blog and was not so sure if I would find anything new in this book. But then, I’m glad I read the book. It’s a quick read with around 200 pages and very well written. Unlike a regular travelogue, this book is so much personal. It’s like reading the author’s personal diary. It takes a lot to keep one’s soul bare open for everyone to read and judge. Not an easy thing at all and Shivya’s work was very honest and personal. That’s the reason I was connected to the book. The book brings out how travel is actually a life changing experience at every level, from discovering one’s self to breaking the norms to purging onself of guilt or other boxed up feelings. It was both envious and interesting to read about the author’s journey on the “road not taken” in a responsible manner by being respectful to the local communities, their environment, traditions and beliefs. It’s exactly this kind of travel that actually sparks the wanderlust in the readers rather than a just few clicks of some luxurious hotels and edited photographs of touristy spots. With a very few pictures but a lot of personal experiences and great stories, Shivya succeeded in transporting the reader to all the places along with her, be it the Amazon forests or Alps or the Thar desert. Knowing about the native communities, nomadic tribes, constellations, ethical dairy practices was such an eye opening experience.The book leaves the readers with so much to think about and introspect, get inspired and that’s a strong reason this book is a must read. Congratulations, wishing you many more successful innings. Yes, keen to understand the process of writing the book. Thanks; shall be sharing more soon! That’s great, thanks for sharing R; hope you’ll enjoy reading the book too! Congrats….wishing you continued success and self fulfillment. Met you when you overnighted at Thanna’s. Have been following you since…and I thoroughly enjoy your vividly exciting blogs. All the best. Thanks Anna! Hope our paths cross again soon. It is so motivational to see, how a girl of same age taking big decisions in life and is not afraid of the Future. It has always been amazing to read your stories, they are like a combo of Hindi movie masala and Disney fairy tale. Just preordered the book, really excited! Just ordered on Amazon. Cant wait to read it ..
Hey, I would love to pre-order. But I’m travelling right now — any plans for a kindle edition? I see only paperback as an option on Amazon. You need to link to your book on Amazon using their universal country link so that when someone clicks on it, it doesn’t only go to the India Amazon store (it will automatically detect the buyers country and redirect to the appropriate Amazon store, i.e, Amazon.com, Amazon.uk, etc.). Some will get confused when they land on your book page and it shows the price as 212. Congrats to you! Any idea when it will be available outside the subcontinent? Looking forward to reading soon! Heartiest Congratulations for your book. Eagerly waiting for read your book ( ordered ). Congratulations on your first book! You are an inspiration for many. Waiting to read the book. Ordered Your Book. Waiting to read it. Congratulation. As a follower of your blog and your travel blogging journey, I will make sure to have peep into it. Do you have plan of making it available in kindle version too? Good on you, Shivya! This is thrilling news. I was in Italy when I read about your book and I thought of how you inspire the rest of us to go and follow the desires of a traveller’s heart. While I can’t even dream of doing what you do, this last vacation came at a time when I needed to really have my spirits lifted from my daily routine. Italy was fantastic. And so are you! 🙂 Can’t wait to get my hands on your book. When we meet next, you have to sign it for me! Congratulations once again. Many congratulations Shivya. Will read it as soon as i get a chance to. Hello, I really like your way of writing and follow all your posts. I really want to read the book but am currently studying in the USA. Is there a way I can get it delivered here? Thank you. Congratulations! Not telling anyone about the book was a great idea. I have found that keeping a big project to oneself before completion makes it more likely that we’ll actually finish it. Looking forward to reading it. Good luck. Hey Shivya, I enjoy reading your (super honest) writing when I get some free time. Am also curious to what’s life like being a full time (not to mention lady) travel blogger from India, and learning more about your adventures. I live in remote New Zealand and want to pre-order your lovely book, but it’s not showing up on amazon*.com* (which is where my Kindle is registered with). Happy to know if there happens to be any place else I can buy a copy / e-version. Best wishes and I’ve got a good feeling that your book’s gonna rock! Looking forward to reading your book. So impressive to see someone not just dream, but live their dream. You are a true inspiration! Hi Shivya, Just saw your interview on NewsX channel. Will be ordering your book right away. As someone who has been following you for so long, I feel so incredibly proud of you and inspired. Best wishes to you. Congratulations on your book. You have a cool blog and an inspirational career story so I think your book will also be very good to read. Out of curiosity, can I ask how much of the book is about India (for eg. half, 70% etc)? Heartiest congratulations on your book. Keep reaching new heights. All the best. Really Nice & Thanks for sharing.. I am sure every person who is couped up within a cubicle for 9 hours everyday will dream of sprouting wings and flying all over the world! I am one such person. I am going to get my copy of this book and even if I can achieve that dream, I can at least feel it through your experiences! Keep going and keep inspiring. Hey Shivya. I really got inspired from your blog and your journey as well (even though I did not read your book though, which I will soon). I am planning to open a new travel blog because I am loving travelling and what best way to share it with everyone. Hope to see myself in your position someday and also to explore India first, from every nook and corner and then jump to International domains. Wish you all the best for your future ahead and continue to inspire beginners like me. Previous PostIf I Were a Season, I’d be Monsoon. Next Post15 Awesome Hangouts in Mumbai to Chill, ‘Work from Home’ and Enjoy Vegan Food.